Delicious Australian Macadamia nuts captured in a crispy crunchy biscuit with a delicate infusion of Australian native spices. Its all about the Macadamia Nuts. These are the great crunchy cookie taste of Australia. Bush Cookies are all about the best taste, aroma and flavor. Take a plate of these to a high tea party. your friends will think you made them. 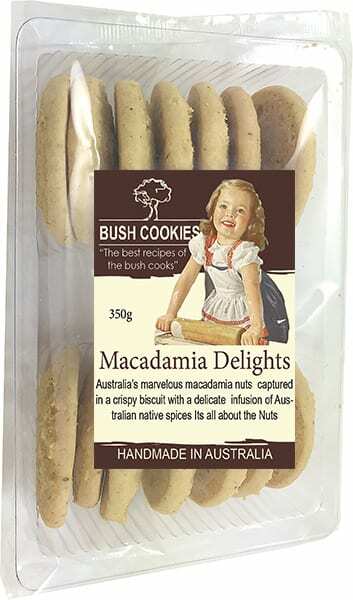 Australia’s premier wholesale bakery deliver wholesale orders of Macadamia Delicht Bickies ( and 17 other flavours), freight free, to grocery retailers and cafes in major metro regions. Order now from our parent company’s wholesale online fine food store Opera Foods. (Register and then log-in to see our wholesale prices).